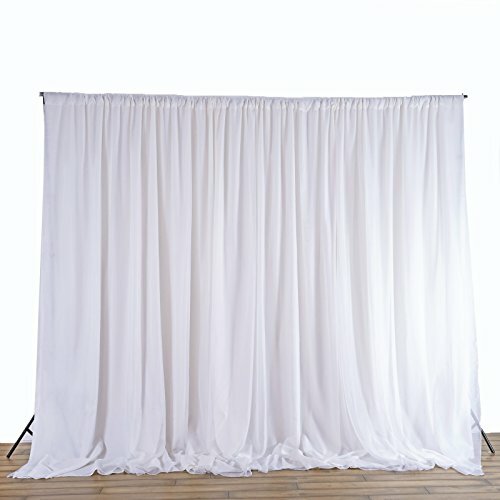 BalsaCircle 20 ft x 10 ft Fabric Backdrop Curtain - 2 colors available by BalsaCircle at Marco Marcucci. MPN: BKDP300_WHT@001. Hurry! Limited time offer. Offer valid only while supplies last. Transforming space and location into a completely different environment without resorting to expensive methods is easy to do with our backdrops. These fabric backdrops are great for weddings, parties, events and even trade show booths decorations. Dimensions: 20 ft wide x 10 ft height. Backdrop made with one color fabric. Each backdrop comes with 3.75" wide fold up on top for curtain rod. PLEASE NOTE: LIGHTS AND ADDITIONAL FABRIC BOLTS ARE NOT INCLUDED WITH THIS BACKDROP, THEY ARE SOLD SEPARATELY.